Kathleen Dawn West, a 42-year-old mom who lived in Calera, Alabama, was found dead in the street near her home last week. Police, who have classified her death as a homicide, are offering no further details at this time. But that hasn’t stopped swarms of amateur sleuths on Facebook from searching through her digital dirty laundry for clues—or major news outlets from following their lead, baselessly suggesting that her death might have something to do with “risque photos” she posted online. Two private Facebook groups created to examine West’s death, Murder of Kat West Discussion Group (Official) and Kat West Murder Discussion, have over 3,000 members combined. The discussions offer a litany of conspiracy theories about what happened to West, with posts featuring local hearsay, screenshots of her and her family’s social media accounts, and even a bloody photo of the street where she died. The Facebook users’ initial interest in West was spurred by her apparent social media accounts, which linked to a subscription-only website promising adult modeling photos. 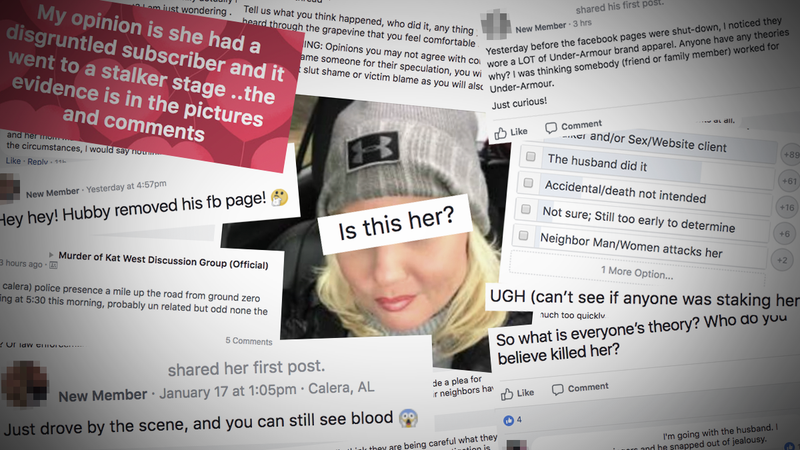 Since then, topics in the Facebook groups have come to include a wide range of conjecture, clues and updates from both locals and out-of-state true crime fanatics. Much of this analysis, however, is ultimately spun from the few threads the late West left online when she died. Administrators encourage members to share their own guesses about what happened, with West’s online “lifestyle” figuring prominently in their conclusions. One popular (completely unsubstantiated) theory posits that a “deranged stalker” who subscribed to West’s website killed her. Other users point to her husband as a more likely culprit. And others still combine various existing theories to create their own. One member suggested West’s (proposed) stalker murdered her because they knew her husband was out hunting. Another posted a photo from West’s husband’s Instagram account of a green liquor bottle—similar to one described by a witness as near the crime scene. Another user expressed skepticism about the hypothesis that West was murdered during a fight with her husband, noting that her body was found across the street from their home. But West’s case did receive the usual, non-lurid coverage by local outlets in the immediate aftermath of her death. After the fanatical Facebook groups were created, however, AL.com published a story covering the more salacious details of West’s online presence and the existence of the groups. And on Friday, the Associated Press ran an article with even more information about West’s online life and the Facebook groups, which was syndicated by The Washington Post and The New York Times. Bearing the headline “Killing of Small-Town Online Exhibitionist Shocks Community,” the AP story specifies the monthly subscription price for West’s “sexier images” site and claims police “are now faced with a question: Did West’s online activities play a role in her death?” But no publicly disclosed evidence or statements from authorities have connected West’s social media activities to her killing in any way. Asked for comment, the Calera Police Department provided Gizmodo with a public information form on West’s case, saying, “this is the only information we have to release at this time.” The report doesn’t include any information linking the her death to her internet presence, nor does it identify a suspect. At this point, attributing West’s homicide to provocative photos she shared online is pure conjecture at best, and victim shaming at worst. “I think her lifestyle is part of who she is,” an admin of one of the groups who asked to speak anonymously said over Messenger. “You project to social media what you want known about yourself. As long as someone isn’t saying she deserved to die because of the lifestyle she led, or shaming her because of them, we don’t shy away from them.” The admin added that victim shaming isn’t permitted in the Facebook groups. It’s clear that these private Facebook groups offer members with similar interests a space to freely entertain their most ludicrous ideas. With West’s case, crime-obsessed users can feed off each other’s fanaticism, unimpeded by the scrutiny of outside observers. (For the most part, at least: Multiple posts by users questioning the substance of the “discussion” show their authors are no longer members.) Such groups make Facebook’s new focus on “building community” seem deeply misguided. In a bubble, any suggestive detail is easily mistaken for absolute proof. As we know, internet investigations like these can lead to serious, even violent, consequences in real life. “Pizzagate,” the conspiracy theory that John Podesta and Hillary Clinton were running a child-trafficking ring out of a Washington DC pizzeria, was chiefly driven by “citizen investigators” on 4chan and other websites. In the end, it inspired a 28-year-old North Carolina man to travel to the pizza parlor and fire a rifle inside the restaurant. And after the Boston marathon bombing, internet sleuths tried to identify the bombers by inspecting photos of the crowd. They did—incorrectly—and innocent men unconnected to the attack were harassed, interrogated by reporters, and even ended up on the cover of The New York Post. In addition to the dangers posed by promoting rumors and misidentifying suspects, these amateur investigations can directly interfere with actual police inquiries. According to the Shelby County Reporter, police claimed on Friday that “much of the information and speculation” shared by media outlets and on social media “has hindered their investigation” into West’s death. We have reached out to the Associated Press for comment and will update this story if and when they respond.